Celebrating its 10th anniversary, the Larry H. Miller Tour of Utah has expanded to seven days of racing and community festivals this year. The race spans the most beautiful and challenging terrain in Utah, and crosses into Wyoming for the first time. Southern Utah, known for its lush forests and red rock spires, will be the start of this year’s Tour for a second consecutive year. Riders will then make their way north, traveling through 12 host cities and venues in Utah and Wyoming, to finish in Park City. This year’s Tour of Utah will feature some of the biggest numbers to date, including 17 Ski Utah King of the Mountain climbs, 14 Utah Sports Commission Sprint lines, and passing seven ski resorts. Along with two mountaintop finishes this year (stages 4 and 6), the Tour route will cross the highest point in 10 years during Stage 5 presented by Subaru – Bald Mountain Pass at 10,759 feet above sea level. A total of 16 professional teams are scheduled to compete in 2014, expecting to bring more than 120 athletes from 32 countries. With six Pro Teams coming from the Tour de France to compete in Utah, fans should plan to go to the start line area for any of the seven stages to see the world’s best riders up close and personal. Autograph Alley opens one hour prior to each stage start. It is free for any spectator to take a photograph or request a signature. And listen to race announcers interview the top riders. It’s a great place for children to see the action up close. Want to spend time near the finish line and find something for the entire family to enjoy each afternoon? You can’t beat the festival activities in the Tour of Utah Lifestyle Expo, which will take place near at all the finish line host venues. The interactive displays and merchandise mecca opens midday each and every day. If your children want to test their skills at the finish line, visit the University of Utah Health Care display to sign up for the free Kid’s Races! Along with this year’s Tour of Utah seven-day stage race for men will be two opportunities to see the best professional women compete on two wheels. In Cedar City during Stage 1 presented by Zions Bank fans can see the Zappos.com Cedar City Grand Prix. In Tooele at Miller Motorsports Park during Stage 3 presented by Utah Sports Commission fans can see the Tour of Utah Women’s Edition. So are you excited to see the best pros in the world here in Utah? You can watch the Tour of Utah on live television from 2-4 p.m. MT every day in Utah (ROOT Sports and KJZZ) and across the U.S. (FOX Sports Network). You can also monitor the Tour from start to finish using Tour Tracker powered by Adobe on your desktop, iPad, iPhone or Android devices. But going to the race in person is the best. Following is some information to help give you some special moments during race week and create memories that will last a lifetime. 113.5 Miles, 8,873 feet of climbing. 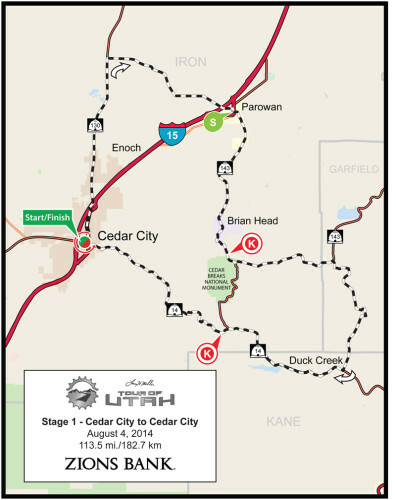 The Tour of Utah opens with a new 113.5-mile course that starts and ends in downtown Cedar City, giving spectators multiple viewing opportunities. The peloton of more than 120 professional cyclists will head northwest through the Red Hills of the Escalante Desert in southern Utah, encounter two Ski Utah King of the Mountain climbs near Cedar Breaks National Monument, then race through Cedar Canyon into downtown Cedar City for three exciting circuits and the finish. If you want to see the Tour twice on Stage 1, the best way to do this is a Parowan-Cedar City combination. The race will pass through the Parowan Gap, which is listed on the National Register of Historic Places for its ancient Native American petroglyphs and into the town of Parowan for the first of 14 Utah Sports Commission Sprint lines for the week. You can get some great photos in Parowan when the race comes through around lunch time. Then drive down I-15 and spend the afternoon in Cedar City for three exciting finishing circuits and the finish. The other option is to stay in Cedar City and experience two races! The Zappos.com Cedar City Grand Prix is a fast, 1.2-kilometer race downtown for professional women from 12 noon to 1 p.m. Following the women’s race, head over to the Tour of Utah Lifestyle Expo located along Main Street near North Street. From this vantage point you can listen to live music until 2 p.m., take part in a poster contest, visit vendor tents and watch the race on the jumbo TV screen with announcers give you the play-by-play. The most exciting moments should be in Cedar City as the riders will use University Boulevard and Thunderbird Way to pass through Southern Utah University for three adrenaline-packed laps and sprint to the finish on Main Street. Amazing views and rugged challenges along Scenic Byway 12 return this year as part of the 130.7-mile stage from Panguitch to Torrey. Stage 2 presented by iON Camera takes a northerly, serpentine path through Red Canyon, Bryce Canyon National Park, Grand Staircase-Escalante National Monument and the Dixie National Forest for the longest day of racing of the week. Racers will encounter 10,162 feet of climbing and four Ski Utah King of the Mountain climbs. After cresting the fourth KOM of the day at Boulder Mountain, the peloton will streak 20 miles along the shadow of Capital Reef National Park for a sprint finish under the canopy of cottonwood trees on Main Street of Torrey. There’s a lot going on for families in Panguitch for the stage start. Get to town early for the all-you-can-eat Lion’s Club breakfast from 7:30 a.m. to 9:30 a.m. If you bring a Tour of Utah poster, you’ll get a free cowbell. And if the kids bring a completed Mike & the Bike Activity Book (download online or pick up locally at Panguitch City Office/Library), the city will give away a special prize. There’s also complimentary face painting, local vendors and Autograph Alley. With some of Utah’s beautiful landscapes, the course is wide open to some amazing photo opportunities and places to see the riders. Just understand that you won’t be able to pass the peloton on Scenic Byway 12, so you need to get your first looks at the peloton in downtown Panguitch for the start or along Highway 63 at Red Canyon, which is the first Ski Utah KOM just 10 miles after the start. After you watch either of these early segments, you can then drive back highways 89/62/24 to Torrey (allow close to two hours) for more great scenery, western hospitality and the full-speed, straightaway finish in downtown close to 4 p.m. If you are just going to Torrey for the finish, get there early! At Town Hall Park you can take part in Bike Jousting and Bike Croquet from 10 a.m. to 12 noon. The kids can take part in the University of Utah Health Care Kids Sprint to the Finish at 1 p.m. And the Lifestyle Expo with a jumbo big screen showing race coverage will keep you on top of the Tour of Utah until the big finish. After two days in the mountain and monuments of southern Utah, the Tour once again returns to its roots in Lehi and Utah County for day three, where the first edition started 11 years ago near the Thanksgiving Point Museum and Gardens. After a start at the headquarters of IM Flash Technologies, the course turns south to follow the western shores of Utah Lake. This 118.3-mile stage winds into the East Tintic Mountains for the day’s only Ski Utah KOM in Eureka, a mining “ghost town” listed on the National Register of Historic Places. On the way to the fast finish at Miller Motorsports Park in Tooele, the race continues through the west desert and along many of the same routes used by the Pony Express. The venue for the finish will be great for spectators, hosted at this state-of-the-art road racing facility that was completed in 2006 for automobiles, motorcycles and karts. Cyclists will make three circuits along the twists and turns of the 2.2-mile East Track at Miller Motorsports Park. On paper, the day may look like a sprinters’ dream, but don’t under estimate the wind in the Tooele Valley and the difficulty of racing on a wide-open and twisting track. With wide-open views, comfortable accommodations and a jam-packed day of racing, Miller Motorsports Park is the place to be on Wednesday. Starting at 12 noon, catch the inaugural Tour of Utah Women’s Edition. The professional men in the Tour of Utah are expected to finish between 3:30 – 4 p.m. Then catch the Chase Pinkham Memorial Criterium for amateur men, women, and juniors taking place from 5 – 8:30 p.m. For the first time in Tour of Utah History, the Tour of Utah Women’s Edition is not to miss, as the professional and elite women lay it all on the line during a brutal 15-lap circuit race. With something to prove, and an extremely talented field, these women will push their limits, making for an exciting race to the end. The Tour of Utah returns to Ogden for a sixth time. 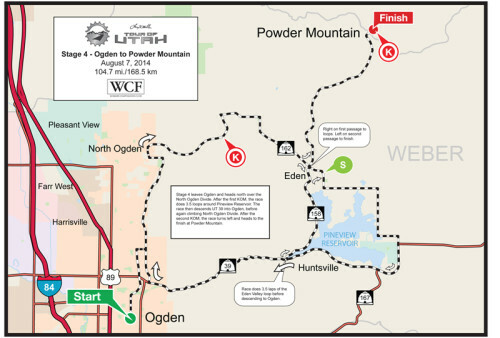 Ogden is the start for Stage 4 presented by Workers Compensation Fund. Known as the “Crossroads of the West,” Ogden most recently hosted the Tour in 2012 with two stages. The start of the 104.7-mile stage will take place on Historic 25th Street in downtown Ogden. Festivities begin at 10 a.m. with the University of Utah Health Care Kids Sprint to the Start, so see the future of cycling exhibit skills on the same race course as the pros. This will be followed by Autograph Alley and Rider Sign-In. The route travels through the Ogden Valley toward the North Ogden Divide for the first of two ascents. The first of three Ski Utah KOMs will be on the slopes of the North Ogden Divide, a tough five-kilometer climb with an average 10-percent gradient. The race circumnavigates Pineview Reservoir three times before it descends Ogden Canyon for another trip though the city of Ogden on Harrison Boulevard and a second climb up North Ogden Divide. So once you watch the start Thursday morning in downtown Ogden, grab some lunch and head over to Harrison for a second look at the peloton. The first big shakeup in the General Classification could happen on the slopes of the first mountaintop finish of the week at Powder Mountain, one of the toughest climbs in Utah. This new addition to the Tour ascends over 3,000 feet in just six miles. And to make it even tougher, the road lacks switchbacks, forcing riders to stare down this beast of a climb with every crank of their pedals. With the finish at Powder Mountain being the first of two mountain top finishes for the week, the Larry H. Miller Dealerships leader’s jersey is likely to switch hands. Watch the riders come up the North Ogden Divide on the first loop, then after the race caravan passes, head to Powder Mountain. 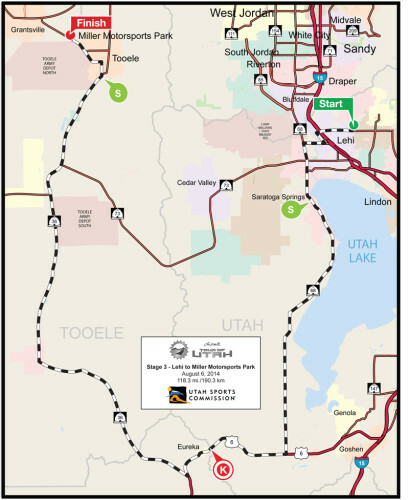 For the first time in race history, the Tour of Utah will extend beyond the state borders. 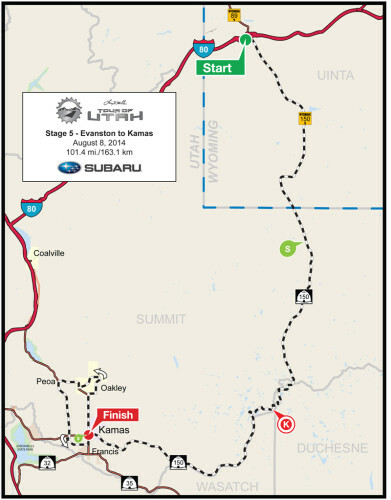 Evanston, Wyoming will host the stage start for 101.4 miles to Kamas. Evanston and Kamas are the two gateway cities to the High Uintas Wilderness and the beautiful Mirror Lake Scenic Byway (State Road 150). Start line festivities will begin at 9:30 a.m. in front of the Union Pacific Roundhouse and Machine Shop in Evanston, which will include a reenactment of a wild-west shootout. Heading south on Mirror Lake Highway, the peloton can expect to confront strong Wyoming prairie winds before beginning the long ascent to the lone Ski Utah KOM of the day at Bald Mountain Pass. At 10,759 feet above sea level, Bald Mountain Pass is the highest point the Tour of Utah has ever reached. If you want to see the Tour on this beautiful stretch of highway, get there early and plan to stay all day. You won’t be able to drive around the race to see the finish on Friday. After conquering the pass, the route continues with a long 30-mile descent into the Kamas valley, which has been part of every Tour of Utah since 2006. Spectators will see the peloton twice in Kamas, as the race will pass through the classic western downtown for a circuit through Oakley and Peoa then return to the finish. For the first time in Tour history the riders will get their first taste of the wild west on Democrat Alley in Peoa, with a two-mile stretch of dirt road less than 10 miles from the final sprint in Kamas. Riders will have to take extra caution, and stay near the front if they want to avoid trouble during this two-mile dirt road and set their team up for victory as they barrel to the finish line in Kamas. Downtown Kamas will have host live music, a BMX demonstration, Kids Sprint to the Finish races and much more all afternoon. With five days of hard racing in their legs, the riders will now have to tackle some of Utah’s toughest climbs for the “Queen Stage” on Saturday. It not only covers new territory on the 107.2-mile route, but has added more climbing this year. 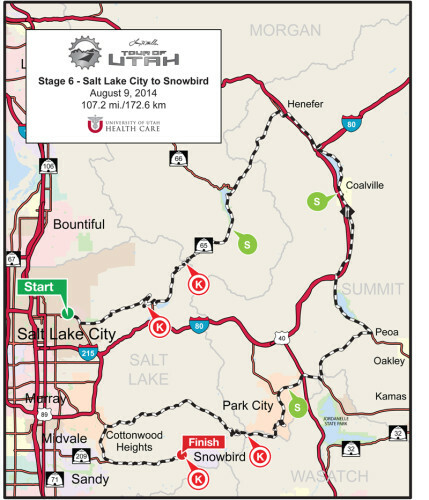 Close to 13,000 feet of elevation gain and four Ski Utah KOMs will make Stage 6 presented by University of Utah Health Care a true challenge for the pro cyclists. The race begins in Salt Lake City, just outside Rice-Eccles Stadium, the site of the Opening and Closing Ceremonies of the 2002 Olympic Winter Games and home for University of Utah football games. The Announcer’s stage for Rider Sign-In and Autograph Alley will be set up in the West Stadium Parking Lot Saturday morning, adjacent to a large Kids Zone. Activities begin at 9:30 a.m. and the first 500 fans will receive free commemorative 10-year anniversary cinch sacks as a gift from the Tour. You can ride TRAX to the University of Utah campus and use the Stadium station to access the start area (1349 E 500 S).And if you come early at 6:30 a.m., you can cheer on hundreds of amateur cyclists as they depart for The Ultimate Challenge presented by University of Utah Health Care and Utah National Guard. The first of four Ski Utah King of the Mountain climbs on the day comes after the crest of the Emigration Canyon climb.The second Ski Utah KOM at Big Mountain may be the best place to see the fireworks begin, but you’ll need to be in position by 11 a.m. to avoid road closures. With Big Mountain only 15 miles into the stage, an early break will be eager to get established, meaning high speeds and brutal attacks. 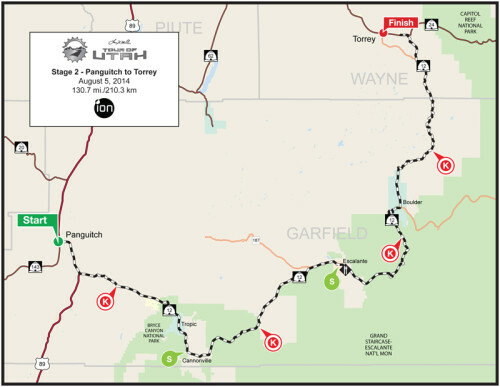 Fans will find Big Mountain offers a great view of the riders as they climb switchbacks to the top, making this a great first stop to watch Stage 6 presented by University of Utah Health Care. After all riders crest the KOMs, motorists will be allowed to drive down Highway 65 south to Parley’s Canyon. There should be enough time to take I-215 South to South Wasatch Blvd to access Little Cottonwood Canyon. The six-mile climb to Snowbird Ski and Summer Resort is the second Hors Categorie climb of the week. (Special note – the road up Little Cottonwood Canyon closes to all motorists at approximately 1:30 p.m.) You then have two options to see the finish: a) make your way to the finish area at Snowbird Ski and Summer Resort using Entry #2, or b) stop at Tanners Flat along the climb, where you’ll find the steepest section, tailgate parties and other fans wearing crazy costumes. Use your mobile device to follow the race on Tour Tracker powered by Adobe as you wait so you don’t miss the action. Start Time – 12:20 p.m.
For a fourth time, the Tour of Utah returns to Park City for the grand finale. Stage 7 presented by VLCM & Barracuda Networks has been the decisive stage the past two years for the Tour of Utah. Come to Historic Main Street in Park City, before the riders embark on the final stage. An expanded Tour of Utah Lifestyle Expo will open at 10 a.m. with interactive displays and festivities on Main Street, from Heber Avenue to 4th Street. Autograph Alley opens at 11 a.m. on the Main Street side of Kimball Art Center, just listen for race announcers Dave Towle and Brad Sohner! Once the gun goes off, the riders make two neutral laps in Park City, then head out of town on Kearns Blvd to the first Utah Sports Commission Sprint line in Kamas. 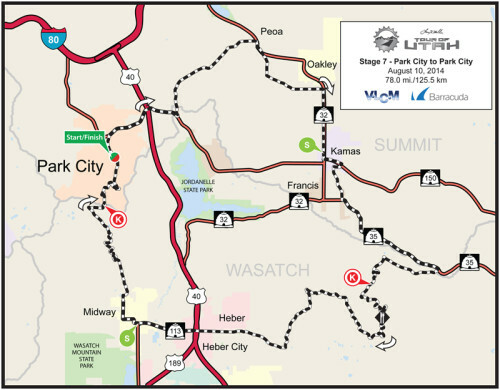 This 78-mile stage was introduced in 2013, rolling out of Park City into rural, eastern Summit County. As the racing continues through Wolf Creek Ranches, the racer will face a short, but punishing climb with pitches of close to 20-percent gradient. In Wasatch County, the race continues winds through the towns of Heber City and Midway. It is just outside of Midway where the racers are faced with the toughest challenge of the entire seven-day event, the climb up Empire Pass. In just three years, Empire Pass has become legendary for its average gradient of 10 percent and sections that exceed 20 percent. You can stay in town for lunch then journey up Guardsman Pass to watch the riders as they ascend up Pine Canyon Drive out of Midway. This is the backside of Guardsman known as Empire Pass, and what 2013 Tour of Utah Champion Tom Danielson calls “my favorite climb in the entire world.” With beautiful scenery and large groups of fans, it makes it the perfect place to turn on Tour Tracker powered by Adobe and follow the peloton. Empire Pass is an HC climb and is the final of 17 Ski Utah King of the Mountain climbs for the week. It should also be the most significant of the week, as spectators will see firsthand who may be the ultimate victor for the stage, and “America’s Toughest Stage Race.” Using Tour Tracker, fans can follow the race finish virtually into downtown Park City, then make your way down the mountain for the après cycling celebration.